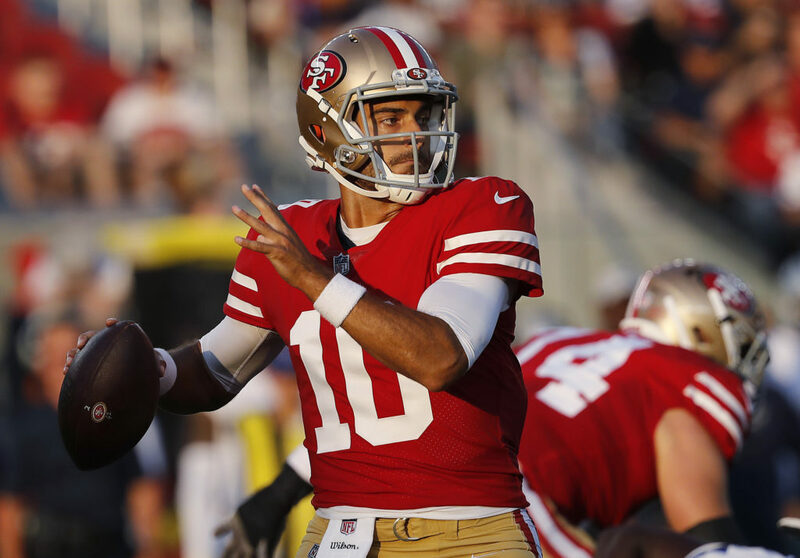 SANTA CLARA – Here’s who stood out during the third non-padded practice and the final day of training camp at the 49ers facility. 1. CB Richard Sherman. Returned to practice after missing the previous 10 days. Took a few reps during team drills and broke up a short pass from Garoppolo which was intended for Kendrick Bourne. Sherman turned, took a few steps back, jumped and swatted the ball away. After practice, Kyle Shanahan suggested the coaches told Sherman the play was coming. 2. FS Adrian Colbert. Broke up a pass from Garoppolo which was intended for Dante Pettis. It was third-and-goal from the eight-yard line. Pettis ran an eight-yard curl from the slot. Colbert read Garoppolo’s eyes and broke just in time to knock away the ball. No one has broken up more of Garoppolo’s passes than Colbert. 3. WR Pierre Garcon. Lined up in the slot on second-and-six and made an 18-yard catch over the middle. You should expect the 49ers to use Garcon in the slot frequently this season, especially when Trent Taylor isn’t on the field. 4. WR Trent Taylor. Caught two passes from Garoppolo during team drills. One was a touchdown pass in the red zone. Taylor still seems to be Garoppolo’s favorite target over the middle. 5. WR Dante Pettis. Made a leaping catch over the middle for the second practice in a row. Both catches came on play-action plays which created huge voids in the middle of the field. 6. WR Aaron Burbridge. Beat cornerback Tarvarus McFadden with a go route up the sideline for a 38-yard catch. 7. TE Garrett Celek. Ran an out-and-up route against defensive end Cassius Marsh, who ended up in man-to-man coverage for some mysterious reason. Celek burned him for a 40-yard catch. 8. TE Cole Hikutini. Made a leaping, twisting touchdown while running a crossing route along the back boundary of the end zone. 9. QB Jimmy Garoppolo. Completed 11 of 16 attempts and threw two touchdown passes and no picks. One his best days of camp. 2. WR Dante Pettis. Didn’t fight to make a contested catch over the middle. Allowed Colbert to step in front of him and break up the pass. 3. WR Marquise Goodwin. Ran the wrong route after Garoppolo changed the play at the line of scrimmage. Goodwin ran vertically up the field. Garoppolo threw horizontally toward the sideline. 4. WR Kendrick Bourne. Caught none of his four targets. Dropped a deep pass while running a go route and a short pass while running a slant. Also fell while running an out route in the end zone. Has not played well during training camp. 5. RB Raheem Mostert. Fumbled during his third carry of practice. Not a lead running back. 6. DT Jullian Taylor. Missed practice with a stomach ache. Sounds like stomach virus. In football, if you play with a stomach virus, you will sh** on your self if you hit in the stomach, which will definitely happen on the line. I am beginning to think Pettis is going to give even the best of the CB’s problems. So you’re saying he’s going to be a real menace? Pettis the menace. Thank you for that. Last practice. Now, on to Houston. Clowney, Watt and Mercilus should be a stern test for the O line. Hope they avoid injuries, and fights. With all the macho bravado, taunting and talking smack, it will be a stern test for the coaches to instill focus and discipline, to prevent fights. Sure am glad they got rid of Rashard Robinson. He extended drives with his stupid penalties. I wonder if CJB is still sticking out his tongue while throwing. With all the joint practices, there have been few fights. Wonder why the Washington /Jets fight involved the whole team. My guess is some bubble players started chirping, and some vets did not like it. Hope the Niners take a professional, businesslike approach, and do not react to the goading. Or you know, you could just google it and actually see the details of what happened. Naw, like your snark, just a waste of time……. You sure they’re going to play…I mean you were on here before the Cowboys game talking about Elliot and he didn’t take one snap. Grant… Anyone credited for causing Raheem Mostert’s fumble? My man Sherman you GOT to step it up this year!! EVERYONE has to 49er fir life!! Are you a card carrying member of the Bloods by any chance? I’m sorry guys but Trent Taylor is extremely overrated. No one seems to remember him getting the ball literally ripped outta his hands for a INT, or how he lost a game with his pick play. Maybe it’s his mouthpiece but I just don’t like that guy…My point is i believe a number of guys on this team could do alot of damage from the slot. I understand Pettis is raw in the middle of the field, but I can’t think of one time that Trent made a contested catch. So based on training camp, why aren’t we trying to trade for a pass rusher. Philly has a slew of them and Raiders aren’t trying to pay Mack. Lets pick up the phone and make the call. Mack is a no go. He will show up. Darnold signed with the rams. So who is worth the farm who is left? “Not a lead back” and this assertion was made because you were a scout; right Grant?Whoops i meant former player.Gosh darn it ,Coach is what i meant to say.Oh no whats come over me i flubbed again ,you’re a mediocre journalist who moonlights as an imaginary Football savant. This kind of stuff is why I have read this blog so faithfully for so long. That and the ongoing saga of that complete buffoon Seb. Every once in a while you get a good nugget of football, but it’s this extraneous crap that keeps me coming back for more. I love you Grant. Seriously I do. Don’t change a thing.